Eating like I’m on some kind of diet? No, this was just what was easy today. I have a miserable head cold and didn’t want to have to work very hard at dinner tonight. 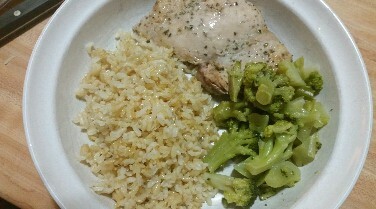 I baked some chicken thighs with some dry seasonings on them (oregano, salt and pepper, garlic and onion powders), warmed up frozen broccoli with butter, and did the same for some brown rice (that I originally made to go with leftovers from Chinese delivery). 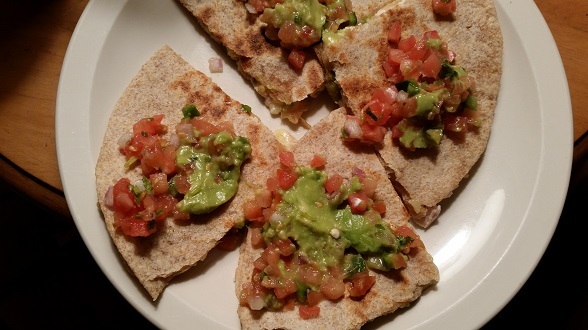 Your typical chicken breast and Brussels sprout quesadillas with guacamole salsa on top. 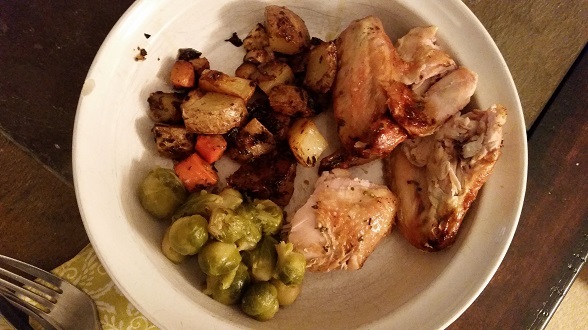 I call it “spa chicken” when I mix up a bunch of herbs and oil and slather it all over the whole chicken before I roast it. For this one I used some lemon zest and juice as well as rosemary, parsley, thyme, and garlic. In the same pan, I roasted potatoes, carrots, celery root, and onion. On the side, I braised some Brussels sprouts in a little bit of butter and water until they were very soft. Rutabaga, braised in beef stock with browned onion and bacon, thyme, and bay. 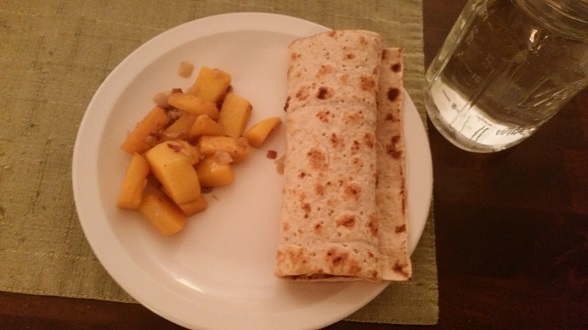 A wrap with chicken breast inside, which I pan seared and finished in the oven (for probably a little too long). I had a meeting to attend tonight. Unfortunately, it was a dinnertime meeting at a restaurant that I currently can’t afford. So I snuck in a gas station chicken sandwich and a bottle of water. It was enough. Happy Hour. With friends. Picked up local fried chicken. Satisfied. Another meeting at 5:30 and no time for dinner. Fortunately, a friend bought me a fast food chicken sandwich and I had ice water. The meeting was more exciting than the dinner, but that’s not saying much.